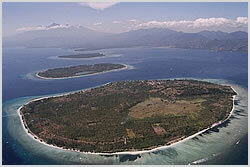 The largest island in the Gili's this one is aimed at budget travellers and is considered the party island. All of the dive sites in the Gili islands can be reached from any of the three islands but this one is the most popular. the sandy bottom at 30 meters has a number of huge sea mounds that rise up to around 20 meters. There are plenty of overhangs and cracks to explore that house morays, crabs and fish. Coral growth is good here and there are some resident garden eels in the sand. A gently sloping reef with good hard coral growth including big slabs of table coral and gardens of staghorn. The reef ends at around 20 meters and attracts the usual fish life. A steeper slope to the north of Gili Trawangan dropping down to 25 meters. There are a series of canyons in the deeper areas that are often home to local turtles. Good coral and reef life at this site. This is the most popular dive site on the island, it is a vast open site with a series of ridges that fall away into deeper water. Coral cover isnt as impressive as other Gili spots but this is one of the better places to see whitetip, blacktip and even the possibility of grey sharks. There are also other big visitors such as rays, turtles and bumphead parrotfish. Manta Point, a little further south, can offer the opportunity to spot seasonal visiting mantas.